Rather than harmful to efficiency and productivity, chat is a crucial part of a healthy workplace and its morale boosting powers should be actively promoted. 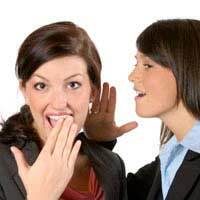 The traditional view of workplace gossip is that it is the scourge of working life that needs weeding out. Conducted by idle or spiteful minds, it has a poisonous effect on the happy and productive work environment. In fact the opposite is true. Chat is actually what binds organisations together as opposed to tearing them apart. Rather than an unruly environment populated by idle gossips and timewasters, a sociable office shows that its members are by and large happy and functioning well with one another. Good communication amongst staff is always one of the most prized attributes of any work environment and a sociable workplace is a reassuring sign it is in a healthy shape. If you walk into a workplace filled with people and are faced with a wall of silence then it’s likely your immediate response is that something is not right. It feels somewhat eerie and unnatural. And it is. Not only does gossip provide a release from the stresses and strains of working life but it also promotes productive team relationships. With so much of our waking lives spent at work it’s crucial that colleagues get on well with one another. However banal or mindless the subject matter of the chat, gossip helps people understand one another better and build up a rapport. Gossip isn’t always inconsequential however. It can actually provide a fundamental way of keeping employees informed about the inner workings of their organisation. But what about when all such good natured gossiping turns sour and becomes whining, surely that has a detrimental effect on productivity and team morale? Recent research at New Zealand’s Victoria University has found that whining – distinguishable from complaining in that is not constructive in any way – even has its good sides. According to their studies, it is useful as an emotional release and as a way to build close and sympathetic relationships with others, thereby strengthening the bonds of a team. It can also be useful as a gauge of other employees’ personalities, motivations and agendas. Moaning can of course be negative but it is an unavoidable aspect of the workplace that cannot be removed completely. If efforts are made to police it then it just moves underground. And if can’t operate in social areas such as canteens and smoking rooms, then it just crops up during working time. Whether it’s constructively, idly, gossipy, bitchy or whiningly – it seems people need to talk. Instead of frowning on any kind of idle chit-chat, the enlightened workplace not only accepts the necessity of employee chat but actively promotes it. Staff members should be encouraged to socialise and get to know one another better by meeting up outside of work for evenings at a restaurant, bar or even for a sporting activity. In addition to this regular team lunches could be organised. Staff should also be encouraged to socialise during break times rather than spend it at their desk catching up on work.